LONDON (Reuters) - The euro remained stuck near 4-month lows on Tuesday after weaker-than-expected economic growth out of Germany and a rise in U.S. Treasury yields helped the dollar recover following a pause in its rally. The dollar’s strength also helped it gain to within a whisker of hitting a 3-1/2 month high versus the yen while major currencies elsewhere traded within tight ranges ahead of a euro zone economic sentiment survey and U.S. retail sales. 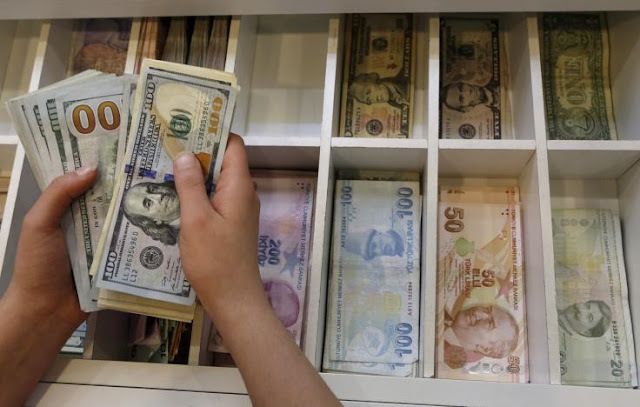 The greenback’s rally, which has seen the dollar claw back most of its 2018 losses after a reassessment of the path of U.S. monetary policy versus other countries, came to a halt last week following disappointing U.S. inflation numbers. Euro bulls were also given a boost on Monday after European Central Bank policymaker Francois Villeroy de Galhau said that the ECB could give fresh guidance on the timing of its first rate hike as the end of its exceptional bond purchases approaches. German economic growth slowed slightly more than expected in the first quarter of the year due to weak trade but analysts called it a blip and predicted Europe’s biggest economy would shift into a higher gear again. The dollar’s index rose about 0.1 percent to 92.646, pulling up from 92.243 on Monday, which was its lowest level since May 2. The benchmark 10-year U.S. Treasury yield increased to about 3.02 percent, after rising 2 basis points on Monday, helping support the greenback. Some traders remain upbeat about the dollar’s near-term outlook. Stephen Innes, head of trading in Asia-Pacific for Oanda in Singapore, said interest rate differentials were still likely to work in its favour. Innes said he would probably remain dollar positive until there is a wave of decent economic data from countries, or until the ECB started to sound “overtly hawkish instead of just tentatively”. The Norwegian crown rose 0.3 percent versus the euro to 9.56 crowns after strong quarterly economic data raised expectations of a rate rise later this year. The ailing Turkish lira to a fresh record low of 4.3990 against the dollar, bringing its losses this year to more than 13 percent after President Tayyip Erdogan said he plans to take greater control of the economy after presidential elections next month.